On Monday, April 29, from 7:00 PM to 9:30 PM at Colts Neck Community Church, we will premier our first quarterly “Fifth Monday” Socialization and Education Event. A potluck supper will start at 6:45 PM. At 8:00 PM we will break up into two concurrent one-hour sessions. Click here to view or print a copy of our "What Helps" document, a guide to how adults in Monmouth County NJ deal with mental health issues and pursue recoveries. This publication includes Mental Health Care System information and contacts. We will follow the decisions of Brookdale Community College for all weather-related closings. Please check www.brookdalecc.edu or listen to WBJB (90.5FM) or WJLK (94.3FM). If they are closed, we are closed. NAMI Greater Monmouth relies entirely on volunteers to carry out our efforts to help people and families dealing with mental and emotional wellness issues. The more volunteers we can get, the more we can do. 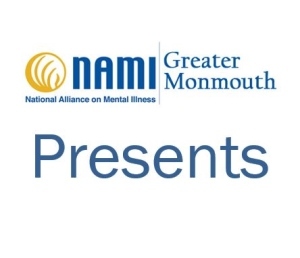 If you are interested in helping, send an email to nami.greater.monmouth@gmail.com and tell us about yourself and ways you would be able to help.